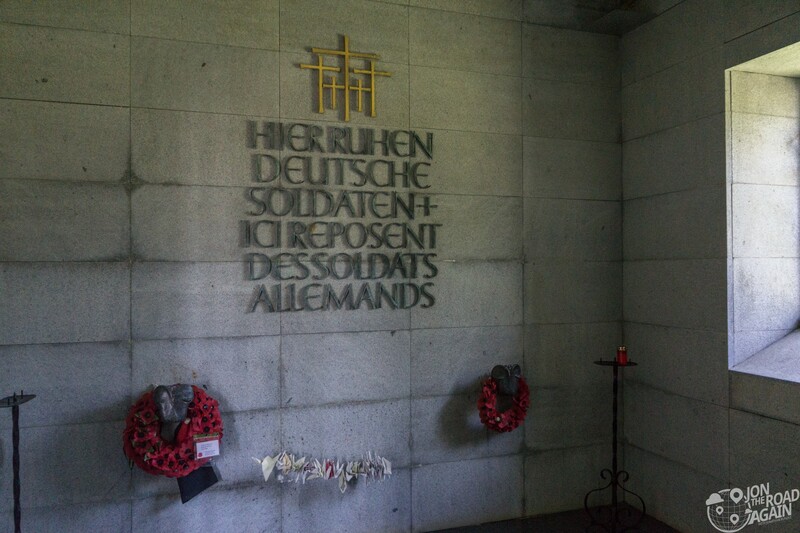 Our D-Day travels around France continue, this time we’re visiting the Normandy German Cemetery. Holding the remains of the aggressors and, eventually, the losing side of the war makes this cemetery much less popular than the various Allied cemeteries scattered around the area. It is important to visit, I think, and further ponder the war, fascism, these men as human beings, and the war many of them probably didn’t want to fight. 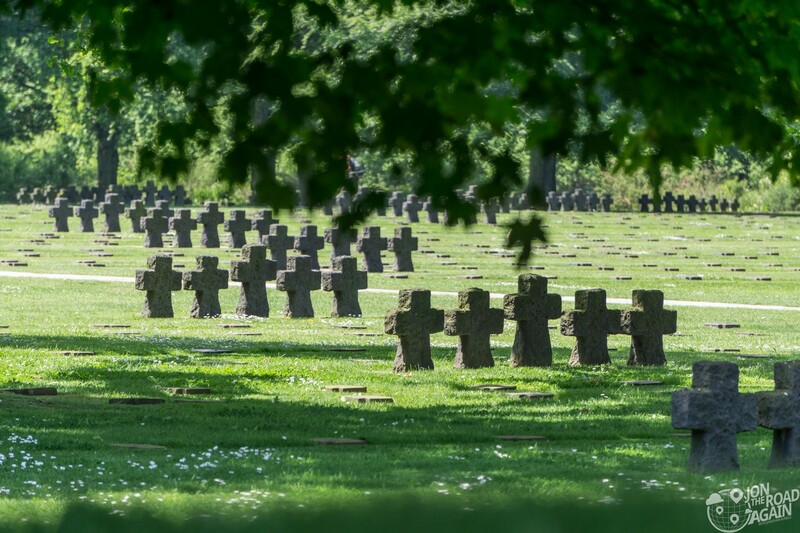 With 21,222 total burials (compared to less than 10,000 at the Normandy American Cemetery) would you believe this cemetery is only the second largest World War II German Cemetery in France? 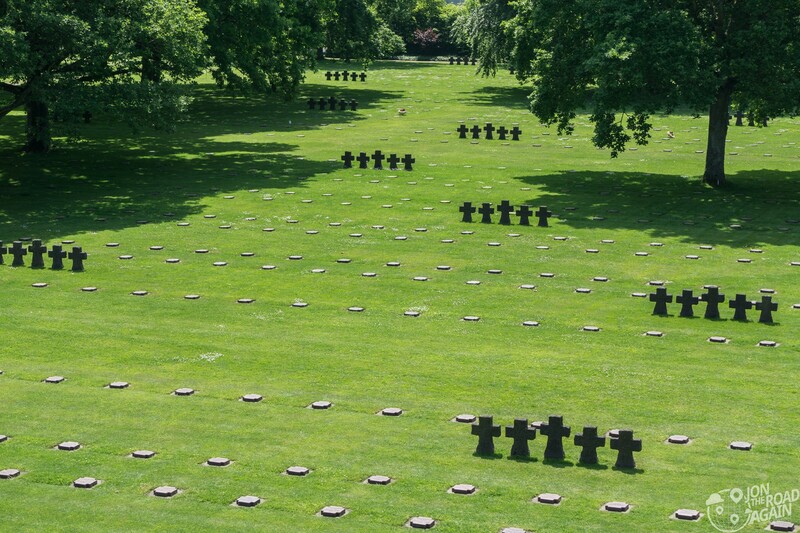 And in fact it is just the 6th largest World War II German Cemetery in all of Europe. The point is, a lot of Germans died. 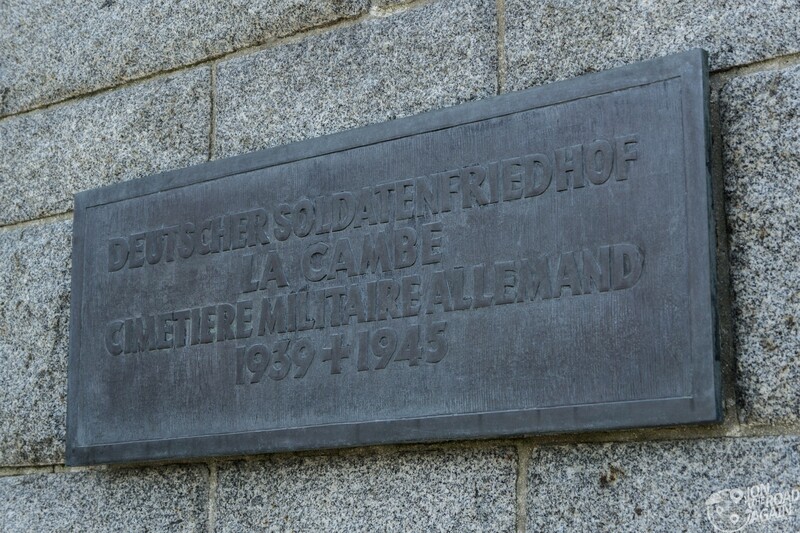 La Cambe is cared for by the privately-funded German War Graves Commission (or Volksbund). 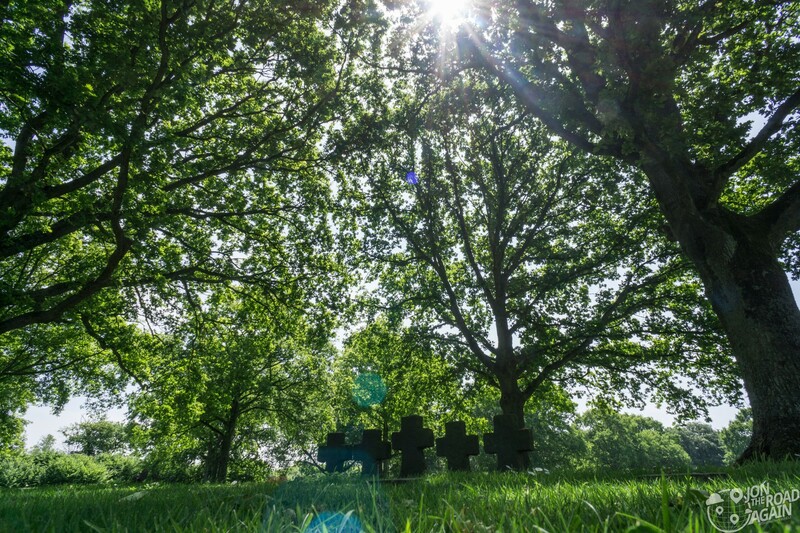 They care for 2.6 million graves in 832 cemeteries in 45 countries. 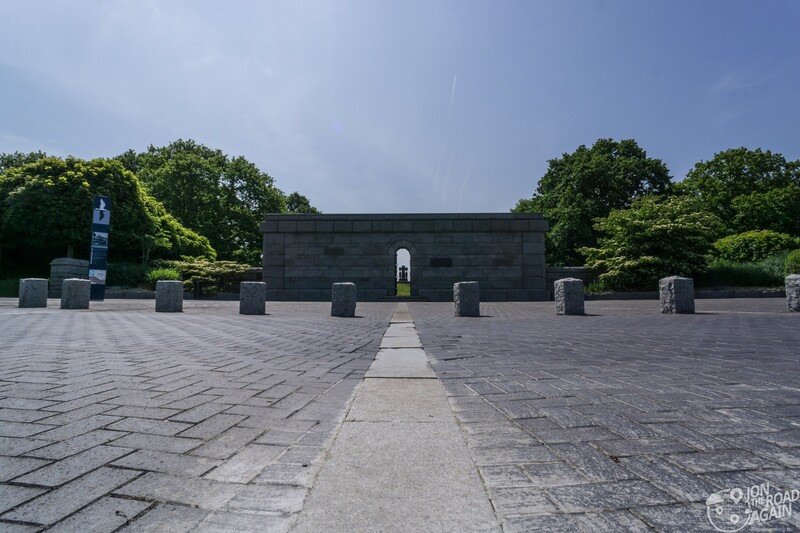 Originally a military cemetery for Allies and Axis, the Americans removed their dead for the American cemetery 10 miles away after 1945. 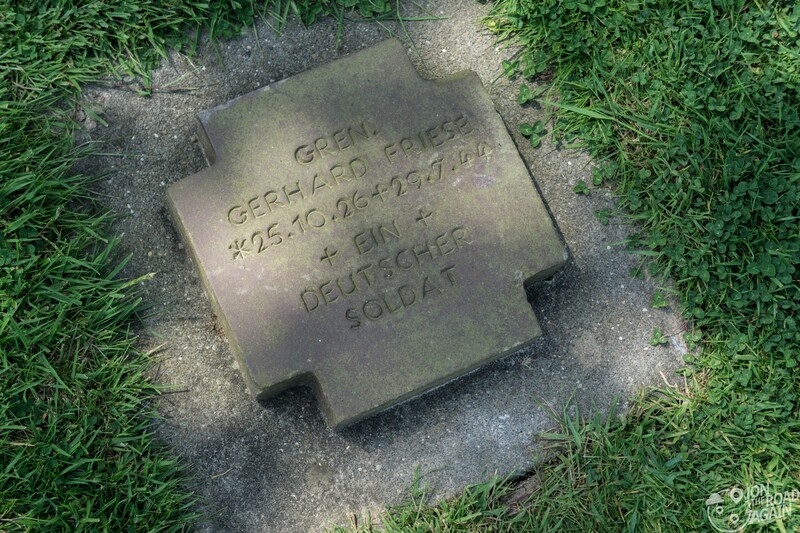 This cemetery was dedicated in 1961 to the German war dead. There are chapels on either side of the entrance gate. 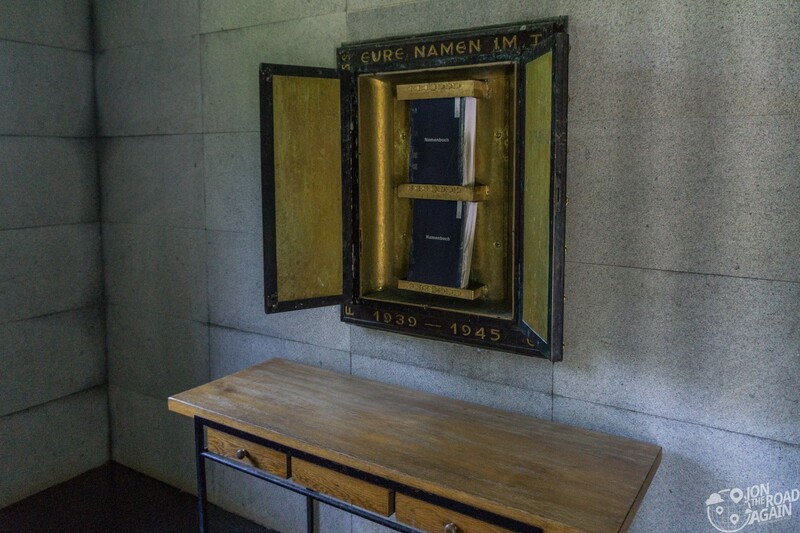 On the wall is the cemetery directory where you can look up your last name to make sure you didn’t have any Nazis in your family. Or maybe that’s just something I would do. There are some very bad people here. 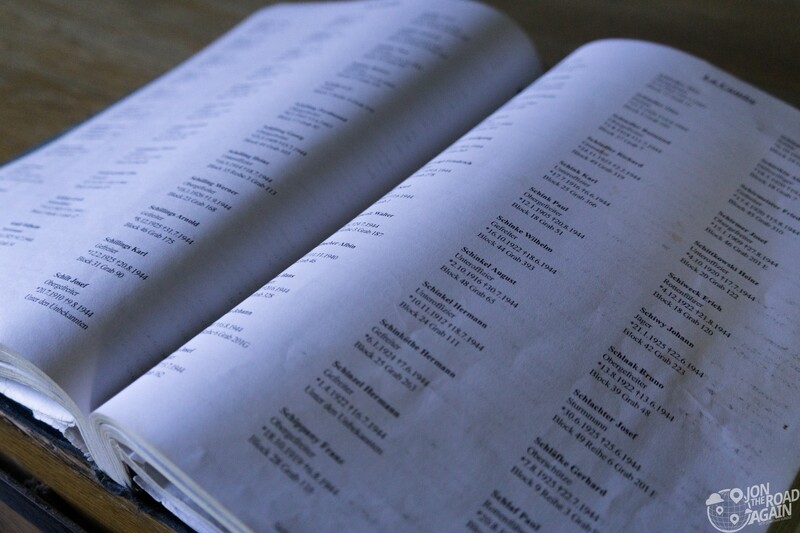 Just looking at this page in the Namenbuch, some of these titles are scary. Rottenfuhrer is an SS rank, one of the worst of the worst Nazi groups, the ones mostly responsible for the Holocaust. One of the worst guys buried here at La Cambe is Sturmbannführer Adolf Diekmann, responsible for the massacre of Oradour-sur-Glane. The SS killed 642 innocent people there in 1944. 247 women and 205 children were locked in a church that the SS then set on fire. So heinous, even the leadership of the SS was to court-martial Diekmann, but he died in battle before he could be punished. Leaving the entrance for the open spaces of the cemetery, you feel death like you always do in a cemetery. I’ve just never been in one before with such a Nazi cloud overhead. I didn’t once feel sad here, and I know many of these men, these kids, probably didn’t want anything to do with Hitler or the war. But at least in my case it’s still tough to give them that benefit of the doubt. The tumulus (a burial mound), visible from all areas of the cemetery, rises 20 feet above the flat ground of the cemetery. 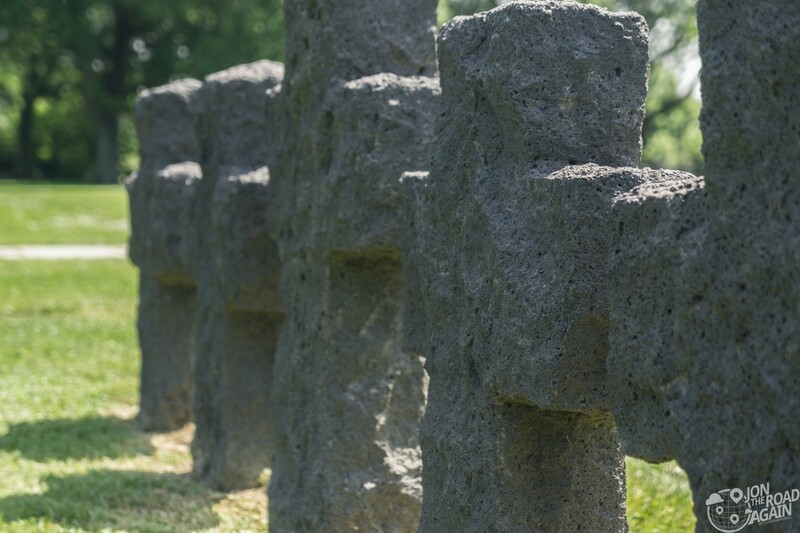 Under the lava rock statue lies 296 mostly unknown German soldiers buried in a mass grave. Knowing that beneath you is a mass grave, it seems odd that you can climb to the top to look out from the top, but the back side of the tumulus has stairs to get you there. 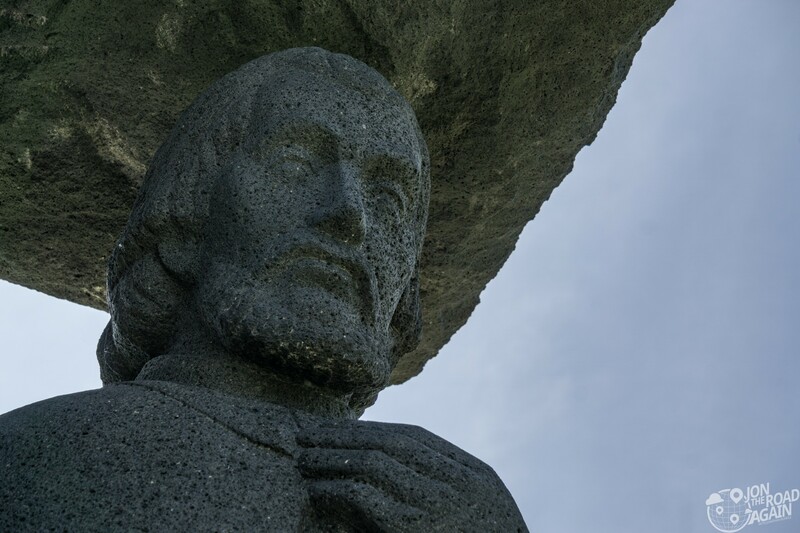 Waiting for you at the top are the figures of Jesus and Mary. 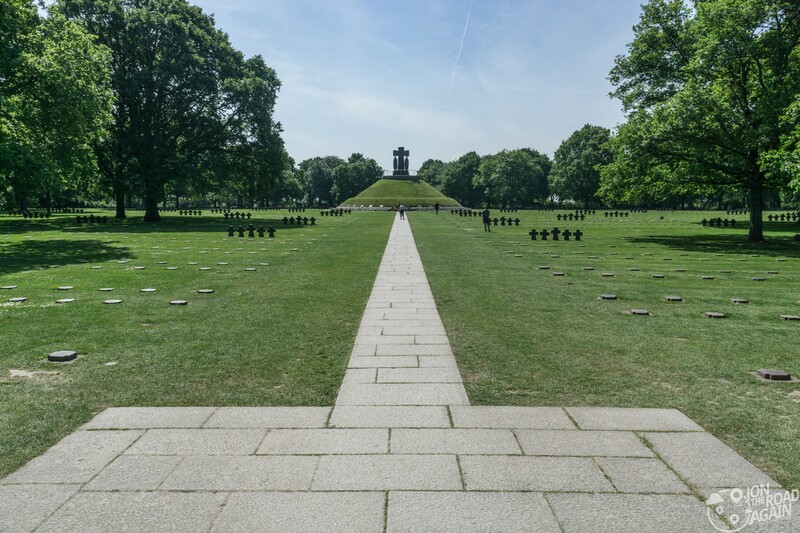 A few panorama photos from the tumulus help show the size and scope of the Normandy German Cemetery. 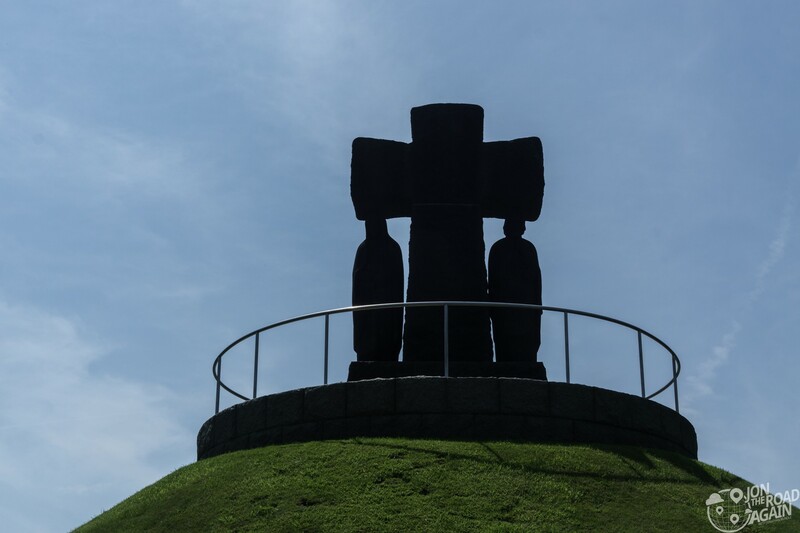 The carved crosses are of the same style as the Jesus and Mary statue atop the tumulus. 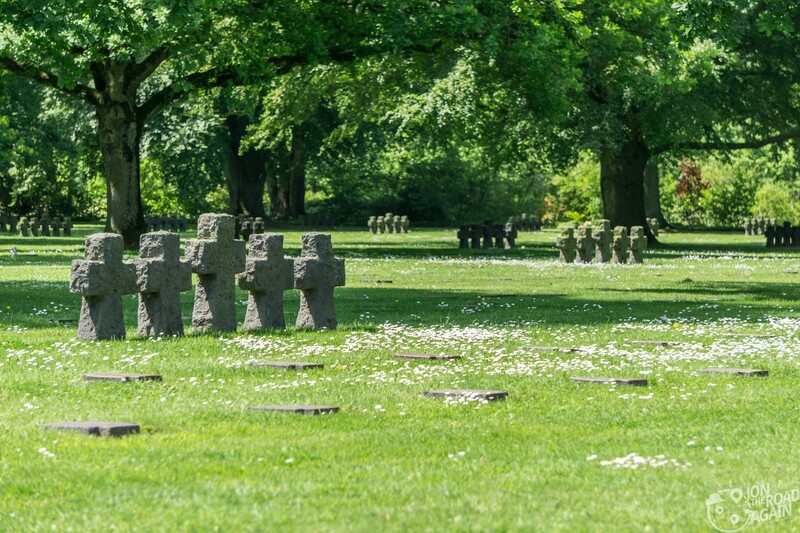 The stones are roughly carved while the gravestones are smooth. The gravestones are somber flat brown markers. Obviously very different from the bright white crosses of the Normandy American Cemetery. Many of the grave stones I encountered were just kids. 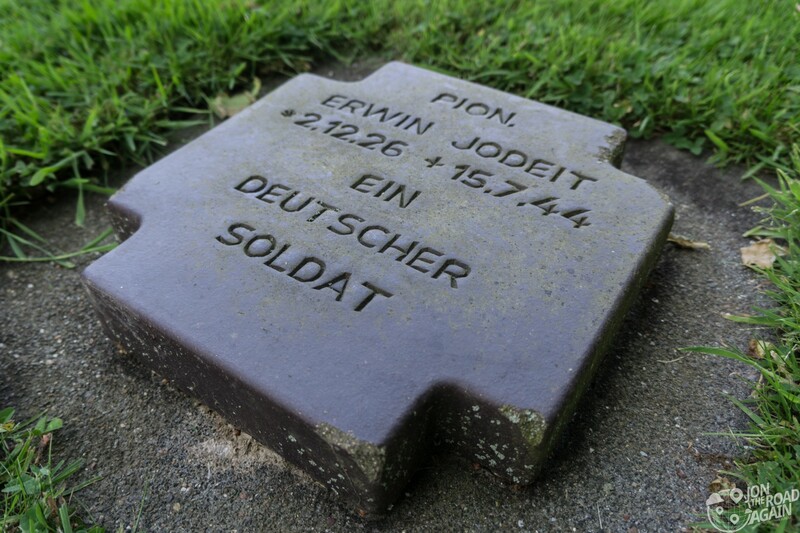 These two soldiers were only 17 at the time of their deaths. It would have been nice to know where they were from, like the American Cemetery shows. But, as Germans do, they kept it simple. 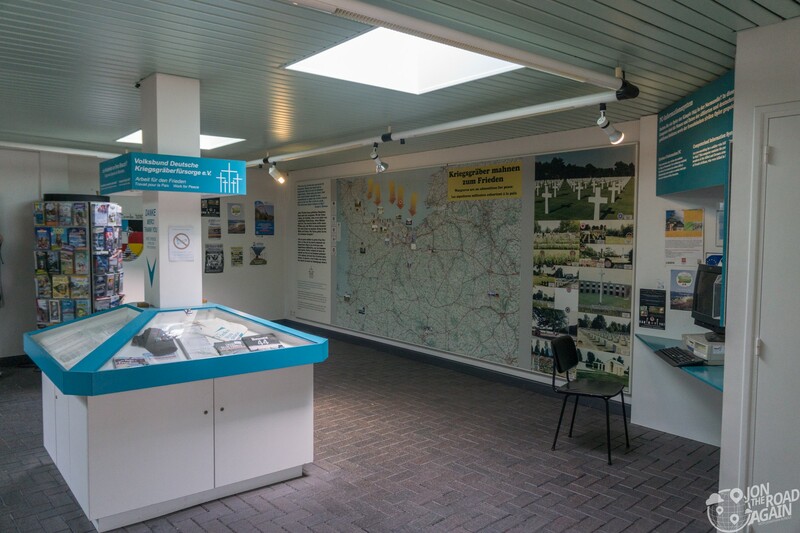 While not a gleaming museum like it’s American cemetery counterpart, the visitor center here does it’s best to tell the story of the Normandy Invasion. It’s a tough spot to talk about WWII from a German point of view, so the center really doesn’t attempt that. 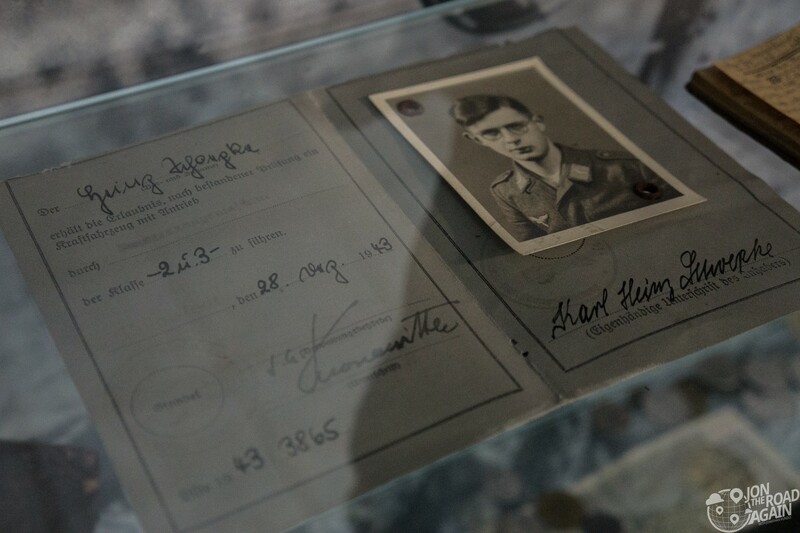 There are some nice artifacts from that time including this German Soldier’s identification book. 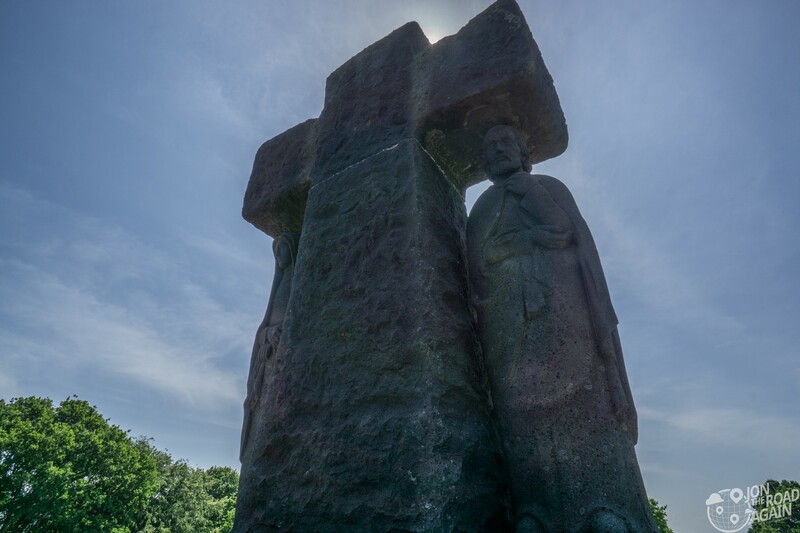 The cemetery is open daily from 8:00 to 7:00pm. The visitor center is open daily from 8:00am to 12:00pm and 1:00 to 7:00pm. Everyone needs a lunch break. A peace garden with 1,200 maple-trees is nearby. It is a pretty sight as you’re driving into the cemetery on a tiny little road. Parking was quite easy, I was one of about 5 cars in the parking lot. 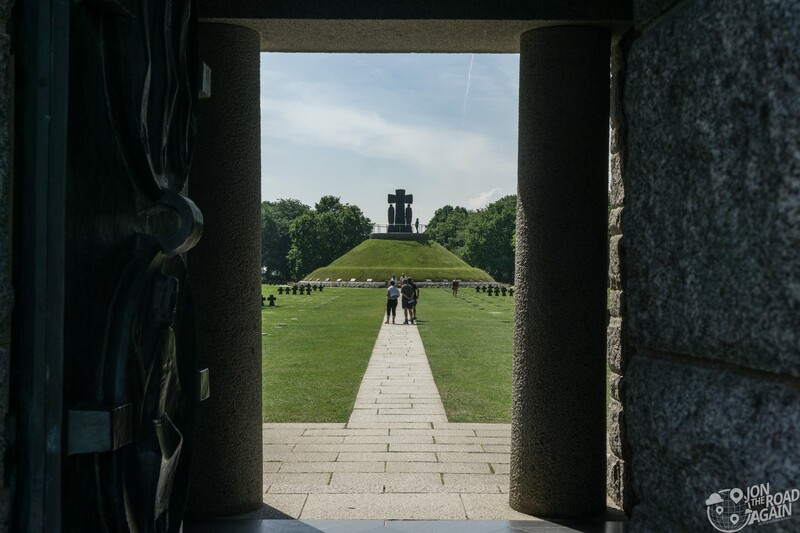 Without a doubt the Normandy German Cemetery at La Cambe is worth a visit in person, especially if you’re in the region to see World War II sites. Your comments reflect the same feelings Mom and I have.